The Finnish heavy metallers are back with their thirteenth studio album “Queen of Time”. Helsinki-based band Amorphis became a notorious band in their home country of Finland for their concept album “Tales of a Thousand Lakes” based on the the Finnish epic poetry “Kalevala”, which helped pioneered the band's signature sound we listen in later albums. Fans will expect “Queen of Time” to have a continuation in sound from the 2015 heavy metal release “Under the Red Cloud”, but once again, Amorphis has evolved, says that this album will indeed follow its predecessor but it will more louder; much more progressive, bigger, and more interesting composition, while trying to retain their original sound and new elements. The band once again recruits Jens Bogren, with the perfectionist at Fascination Street Studios, who is considered as the seventh Amorphis member, the band managed to create an album that surpasses all expectations. During production, the band had some help from various bands and artists, when it comes to implementing middle-eastern music from Lebanese band Ostura, to orchestrations with Francesco Ferrini of Fleshgod Apocalypse. The use of real strings were arranged and recorded in Turkey by Mumin Sesler from Israel who has also worked with Orphaned Land, and Israeli choir Hellscore who specializes choir arrangements in metal music. The “Queen of Time” is symbolized by the image of a bee on the album cover as it provides a groundbreaking epic about the rise and fall of civilization. In Pekka Kainulainen’s words, the lyrical theme is universal about the cosmic powers that people believed in long ago. The album features few guest such as Dutch rockstar Anneke van Giersbergen, returning is Eluveitie’s Chrigel Glanzmann on pipes, singer Albert Kuvezin of Shining and Altaar, and saxophonist Jørgen Munkeby. This is also the first album with the return of original bassist Olli-Pekka Laine after 17 years. Opening is the band's first single “The Bee”, beginning with fast-paced synths featuring siren-like female vocals and laryngeal singing from Albert, then the 30 second intro transitions into the familiar sound of Amorphis. Tomi’s growls tells about the beautiful animals that helps bring life to civilization while his sublime clean voice brings the mournful side of the destruction of the creatures and without them life will discontinue. I enjoy the rhythmic chorus and the strings in the background, the song is a perfect epic intro, it's catchy, melodic, while still retaining those doomy elements. Following the tiny creatures is “Message in the Embers”, coming at listeners with a fast-paced Nordic melodies, the tempo then drops reverting to their mellow signature. The heavier side picks up with some oriental sounds as it returns to song’s folky tunes, the track features a choir around the 4-minute mark which gives the song an extra strength at the bridge giving it a much more wider and fuller atmosphere, I love the part when the choir tones is singing to the Nordic rhythm as the drums, guitars, and the growls gradually rise, taking over the heavenly voices. “Daughter of Hate” is introduced with an organ and riff-driven guitar, the songs takes more of a black metal approach with screams united with oriental melodies. I was completely taken off guard by the sudden saxophone solo performed by Jørgen because I have never heard of a jazz instrument blend so well in heavy metal (other than Beto Vázquez Infinity) and it was placed in a perfect spot to come in. The narration near the end is done by lyricist Pekka Kainulainen which was an excellent role to fill as his “wise shaman-like voice” fits with the music. Fourth track, “The Golden Elk” follows similar structures as “The Bee”. The intro opens like the the first track, but I would say it uses the sounds of nature which fits the habitat of the Elk while using the voice of the siren in the background, after that it's straight to the point progressive. What separates this track from “The Bee” is the use of a full orchestra which goes towards of a direction for a more oriental tune and the acoustic guitar, enhancing the folk component of the song. The way the song ends fades with the piano’s beautiful and gentle tone. The band's second single “Wrong Direction” is more power metal with a cinematic feel, the track gives true Amorphis fans a throwback to the song “The Way” from “Tuonela”. Uplifting and melodic, there is no forced heaviness of “Under the Red Clouds” and Tomi holds back on the growls in favoring for more clean vocals that fits this track, as Loudwire said, Amorphis is a metal act that went soft but still rules. The flute was a nice addition mid-song along with the chantings, and the orchestration near the end gives it a magical atmosphere as the song fades away with the guitar strums. “Heart of the Giant” is a complex song as it opens with a slow guitar solo and then comes in with a sudden orchestra strings slurring in oriental riffs all over the place and the choir filling the essence of symphonic. The song is epic folk metal as it feels like charging into battle in the mountains and the growls is as melodic as the track as it stays in sync. The orchestration in the background increases intensity for the solo duel between the keyboards and guitars before it ends with Tomi’s dual vocals and the choir accompaniment. Our ears are introduced by a flute solo by Chrigel of Eluveitie in “We Accursed”, then kicks off with the high Celtic energy of the guitars and Tomi’s booming voice accompanied by prog-style keyboards. The songs gives of an exhilarating thrill of the loudness and tempo, along with a small Finnish-folk flare mid-song from the synths. Going back to oriental elements is “Grain of Sand, in here, Tomi’s two different voices clashes with each other in this song, his harsh along the guitars distortion and to his clean baritone vocals comes in soaring over the melodies while the choir and strings supports the far eastern sounds. As this duel continues, impressive guitar riffs, synth trills, and pummeling drums gives us one hell of a powerful outro. “Amongst Stars” is an “overarching anthem” that features the one and only Anneke Van Giersbergen, an appearance in which I did not at first expect. With the two, they give us a sort of “the beauty and the beast” style vocals. The piano at the start complements Jousten’s clean voice while Anneke’s embraces the atmosphere with her ethereal voice. Progressive and melodic with a hint of folk, it’s easy listening track for fans of Anneke who may have not heard songs of Amorphis. In my opinion, this is the high point on the album that they recruited Anneke as guest on the album as she previously shared the stage with the band on “An Evening with Friends” Amorphis event for the song “Her Alone”, it was a wise choice to collaborate again. Preferably, “Amongst Stars” should have worked as the better outro due of it's uplifting energy. Closing the album is “Pyres on the Coast” with guitar riffs and and cymbal clashing drumming, Tomi sings his growls more grittier and higher-pitched which is not often he does in Amorphis until he joined Hallatar and the multilayered voices gives off a haunting atmosphere. 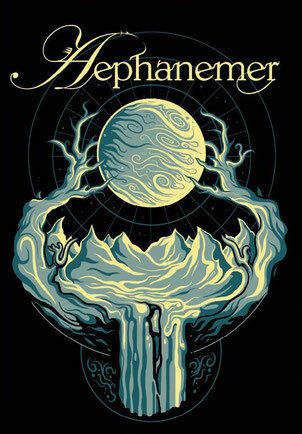 Aggressive and it's ever-evolving song from heavy, doom, power, and symphonic in a span of 6 minutes, the tracks sums up the changing constellation of Amorphis perfectly. Concluding this review of “Queen of Time”, I found no track that was skippable on this album. Every song was enjoyable, each song had it's variety, the components of each song were not overdone. Amorphis has really passed expectation for fans such as myself. This album is truly a standout and will surely be put into everyone's top 10 list for this year. 2018 is the year for Amorphis, starting with a massive festival season, then followed by a large US tour with Dark Tranquility and Moonspell in the fall before presenting their latest works on European stages. "The songs of the new album will also set new standards at our live shows," says Holopainen., and anyone who has heard Queen of Time even once will know what he means by that. I'm giving “Queen of Time” a 10 out of 10!